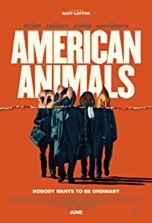 American Animals is the story of how four college-age men bungled their plan to steal some rare bird books in Lexington, Kentucky’s Transylvania University library. The premise sounds outlandish and fictitious. However, as the opening text emphatically states, the movie isn’t “based on” the real story, it is the real story. To ensure validity, director Bart Layton weaves canned interviews throughout the tapestry of the film. This creates a strange narrative flow between the documentary style interviews with the real-life criminals and the dramatized action with the actors portraying them. Other drawbacks are slow pacing and an initially confusing plot…interviewees reference the incident long before we learn the details of what happened on that fateful day in 2004. The film is packed with allusions to other movies, including the “bigger boat” quote from Jaws (1975) and the characters’ assumed aliases (Mr. Pink, etc.) which were inspired by Reservoir Dogs (1992). When things start to unravel during the heist—i.e. incapacitating the librarian and the plan B exit through the first floor stairwell—the film finally finds some energy and urgency. Much like the early stages of the movie however, the denouement is dragged out and many of the silent reaction shots, though emotionally impactful, are painfully long. The movie boasts a cast of talented young actors, headlined by Evan Peters, who plays Quicksilver in the newer X-Men movies. The only other recognizable face in the cast is Ann Dowd, who is best known for her work on TV’s The Leftovers and The Handmaid’s Tale. The most striking sequence in the film comes during the disguise prep scene when a close-up shot of one of the young men creating wrinkles around his eyes cuts to a painting of an owl (and how fascinating that a synonym for thief is owl). It’s a jarring, disturbing cut that hints at the animalistic impulses that are driving these characters toward baser behaviors. There’s a subtle inference that this transformation is also a psychological one (i.e. assuming the traits of different animals), but this potentially fascinating storyline is never explored. The film is a mishmash of themes including: youth is wasted on the young, anything that can go wrong will go wrong and crime doesn’t pay. The movie is also a conglomeration of many different plot elements like: art, crime, college life, documentary filmmaking, etc. This reveals the movie’s narrative indecisiveness—much like the young men it focuses on, the story is in search of an identity. In the end, AA is a unique film both in terms of its subject matter and story structure. If you’re looking for something different, this is it.